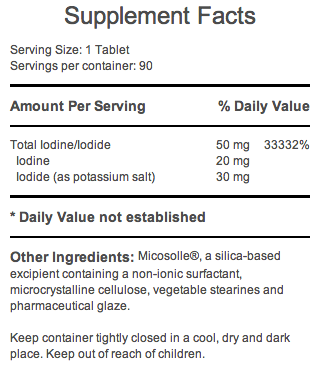 Iodoral IOD-50 by Optimix is an iodine supplement that also includes potassium iodide. Sufficient amounts of iodine may help to promote proper thyroid function. The thyroid is a gland located inside the front of the neck that secretes hormones which help to regulate the body's metabolism. Iodine is used in the production of thyroid hormones and in helping to manage thyroid function. An unhealthy decrease in thyroid function may result in weight gain, fatigue, mental fog, and other health issues. Proper thyroid function, which is supported by sufficient iodine, may help to promote healthy energy levels and healthy weight management. This supplement also includes potassium iodide, which is another source of iodine intended to help promote thyroid function.